Scores of residents of a locality in the Civil Lines area here, most of them just having attained the age to vote, today received their voting identity cards, but full of glaring errors. The Jagraon police has nabbed a member of a gang involved in stealing vehicles for past three years. The police recovered two four-wheelers from his possession. Vasudev (30) of Bihar, who had thrown a boy out of a moving train at the Chowkiman railway crossing two years ago, has been sentenced to five years’ rigorous imprisonment. The left leg of the boy, Aman, had to be amputated. 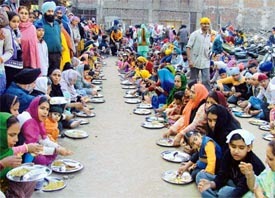 Devotees partake of langar on the occasion of Parkash Utsav of Guru Gobind Singh in Dukhnivaran Sahib gurdwara in Ludhiana on Wednesday. 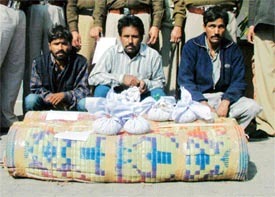 The Division No 5 police today claimed to have busted a gang of narcotic smugglers who used to smuggle poppy husk in the city by hiding the drug packets in straw mats. SP city-I R.K. Jaiswal and DSP Ravcharan Singh Brar told mediapersons that the three accused used to bring poppy husk from Rajasthan and sold it at higher price here. smuggling poppy husk. — Photo by I.V. It was business as usual at Malwa Industries and Spinning Mill, situated near Harian village on the Kohara-Machhiwara road with workers busy with their routine work. Fourteen girls, under training with the garment unit of the factory, had died on Monday in a bus accident that left over 30 injured. 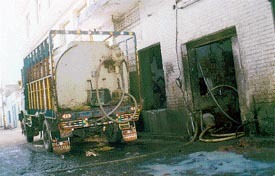 The district Dairy Development Department has impounded a milk tanker in which spurious milk was being supplied in the city. 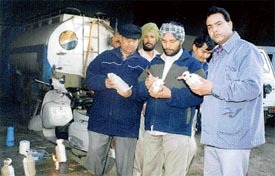 The impounded tanker (Left) and officials of the Health Department with samples of milk. In view of the catastrophe that struck India among other countries on December 26, resulting in massive loss of life and property, city-based Vardhman Group of Industries has decided to contribute Rs 25 lakh towards the Prime Minister's Relief Fund. A team of 12 doctors and paramedic staff of Christian Medical College and Hospital (CMCH) was today flagged off by Mr Anurag Verma, Deputy Commissioner. The team will provide medical assistance and rehabilitation to victims of tsunami tragedy. Two-week Short Term Training Programme (STTP) on ‘Structural and Geo-Technical Aspect of Earthquake resistance Design’ in Civil Engineering Department and on ‘Techniques of FACTS’ in Electrical Engineering Department concluded at Guru Nanak Dev Engineering College. 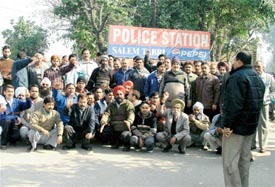 Residents of Manjit Vihar today staged demonstration outside the Salem Tabri police station for over an hour claiming that the police had not registered FIRs regarding three thefts in the colony and released some suspects caught by residents. The Punjab Police has been drawing a flak for its rude behaviour, especially from NRIs, who experience better policing outside. But a constable of the Jagraon police has won over an NRI from Canada who has vowed to spread word about changed face of men in the Khaki. 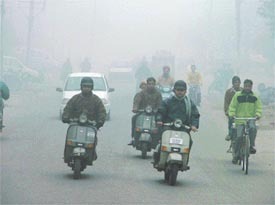 Fog envelops Ludhiana on Wednesday. — Photo by I.V. A milk vendor, who brings milk from Bilga village to Ludhiana in a train, has alleged that the Station Master of Bilga railway station is not allowing her to carry milk in the train following her refusal to give milk to certain railway employees free of cost. Ms Kulwinder Kaur, who brings 60 litres of milk everyday to Ludhiana railway station, in her complaint to the DSM, Ferozepore division, has alleged that her husband had been supplying milk at Ludhiana railway station for the past many years. The non-resident Indian community from Punjab appears to be heading home for outsourcing jobwork. The reason is that input costs here are less compared to existing places of work. Recently one Chicago-based company San Softech, owned by the Sandhu Petroleum conglomerate announced the setting up of business office in Punjab. To commemorate the first death anniversary of Rajinder Sethi, former convener of the local unit of Ram Sharnam Ashram, the activists of Social Welfare Society distributed woollens and footwear to the needy students at a function organised at the local MGMN Senior Secondary School yesterday. The Revenue Officers Union of Patiala division has decided to go on two-day strike from tomorrow in protest against the registration of a criminal case against one of their members. Parkash utsav of Sri Guru Gobind Singh was celebrated here today with fervour in all gurdwaras of the Samrala Sub Division. 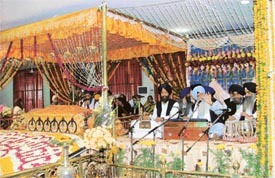 All gurdwaras were decorated and lighted up. 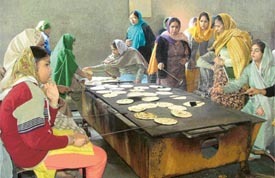 (Left) Kirtan being performed in Dukhnivaran Sahib Gurdwara and (right) Women prepared langar on the occasion of Guru Gobind Singh’s birth anniversary in Ludhiana on Wednesday. — Photos by I.V. Alleging misinformation by steel manufacturers on price hike representatives of the industry said today that the actual price hike was Rs 2,000 per ton and not Rs 500 to Rs 800 per ton as was being spread by manufacturers. The Punjab Organic Farming Association will organise a meeting on Saturday to discuss various aspects related to organic farming. "The meeting is the result of initiative taken by various NGOs, farmers and individuals dedicated to ecology, conservation and organic faming in Punjab," said Mr Umendra Dutt, director, Kheti Virasat. Farmers of the region have condemned freezing of the minimum support price for various crops. They regretted that even the Punjab Government had endorsed the Central Government’s move despite the fact that farmers of the state would be the worst hit. 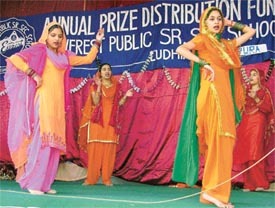 The annual prize distribution function -2005 of Everest Model High School, Giaspura, was held here today. Mr Harpreet Singh Sandhu, Deputy Advocate General, was the chief guest. Mr Hakam Singh Giaspura, Mr Sushil Malhotra, member, Sales Tax Advisory Committee were the guests of honour. Desh Bhagat Ayurvedic College and Hospital will organise medical check-up camps for poor workers in units of neighbouring. This was stated by Dr R.C. Jain, Principal of the college. He said due to meagre resources and lack of time, factory workers could not give attention to their health. Medical camps will be organised in factories and medicines free of cost will be distributed among the patients.